It’s been a most unusual summer. 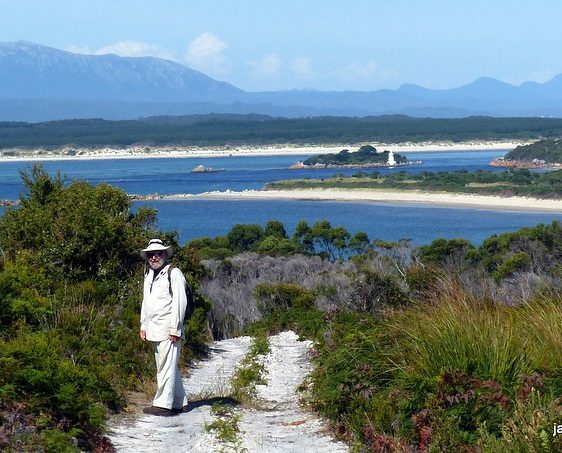 Heat waves across the mainland – Cold and wet down under in Tasmania – Everyone’s complaining. So when a bubble of warm air was forecast to drift over Strahan, we jumped into high gear to prepare for an outing. Ideas flooded our thoughts. Should we take our vessel to Betsy’s Bay and walk across to the west coast or paddle up the King River again. 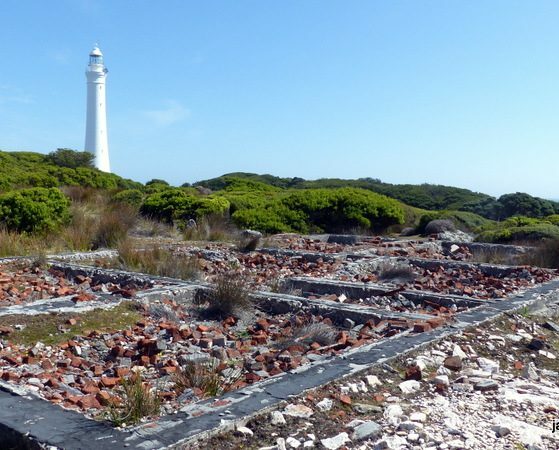 Both were discarded when I hit upon the idea of taking the Green Machine across the harbour to Hell’s Gate, and from there, walk out to the lighthouse sitting atop Cape Sorell that we’ve seen so often from sea. 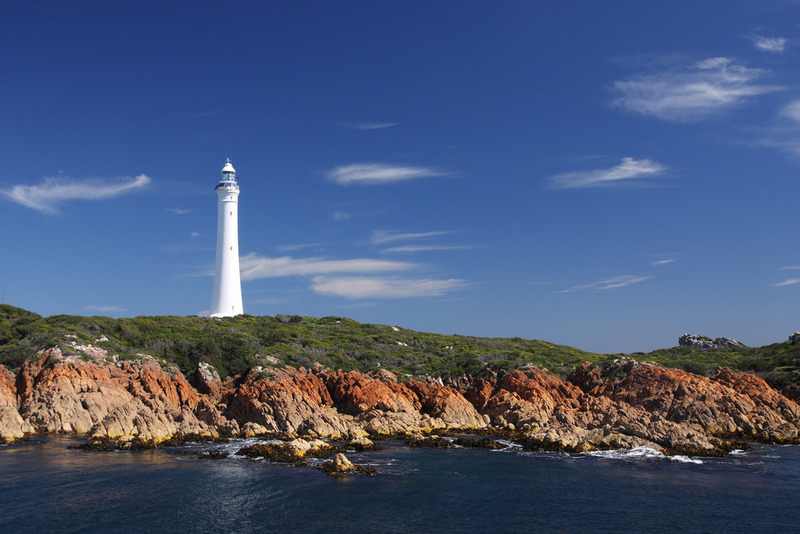 Cape Sorell is named after William Sorell who was lieutenant-governor of Tasmania from 1817 to 1824. 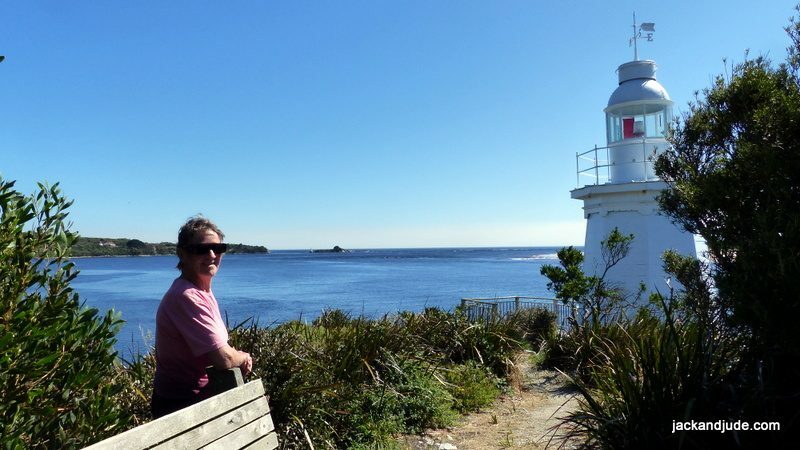 The lighthouse is situated just outside of Macquarie Harbour, about seven km from ‘Hells Gates’, a name given by convicts transported to Sarah Island, their hell, in the early eighteenth century. It was built and first lit in 1899, the tower being the 2nd tallest in Australia. 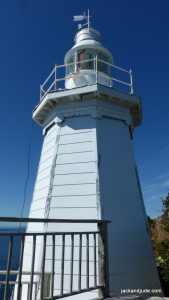 The light was automated in 1971, and then in 1988 the lens was replaced by a solar powered beacon. The three lighthouse keeper’s houses were torn down at the same time. Between 1900 and 1946, a horse drawn wooden-rail tramline provided access, and it was on this track that we planned to walk. It took most of a day to unload and assemble the Green Machine from its long storage after it had been packed away when we’d finished filming in the Furneaux Group last May. The shopping and packing took just an evening, therefore we were good to go when Deek showed up early the next morning. Good lad he is, like his dad Ronnie. We helped him load our kayak onto the back of his ute and then he gave us a good headstart by driving us around to Macquarie Heads. Just across the straits, our first day’s destination was easily seen right next to Bonnet Island, where the penguin boat used to take tourist. Geez, everything was magnificent, even the ebb tide was going our way, except it was scorching hot. 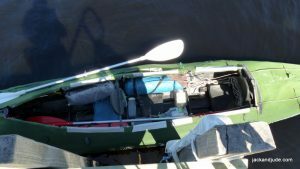 We hadn’t paddled for more than nine months, and heavily laden as we were, it was a bit of struggle. 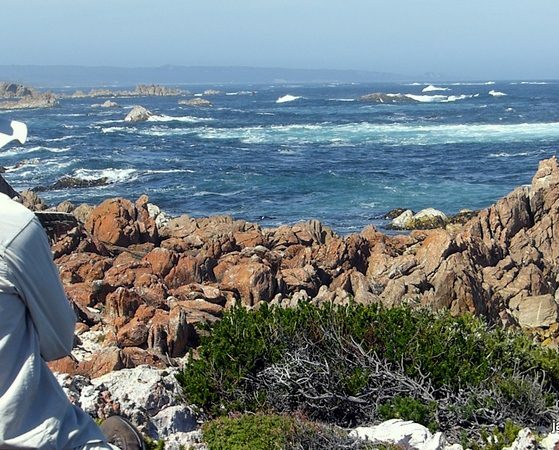 But with our destination in sight and a whole day to do as we pleased, we dawdled along listening to birds chirping onshore while admiring the wonderful scenery around us. Crossing the strait leading out through Hell’s Gate was easier than we’d feared. There was an out going current for sure, but we mastered it and soon pulled alongside the jetty on Bonnet Island that the tour boat used. Never ever been on Bonnet Island before. Been by it lots of times, close by when coming in, but never explored the tiny outcrop adorned with a very cute lighthouse. Straightaway after stretching our knotted muscles and aching joints, we perused an informative sign telling us about the Fairy Penguins that reside on that abrupt rock. 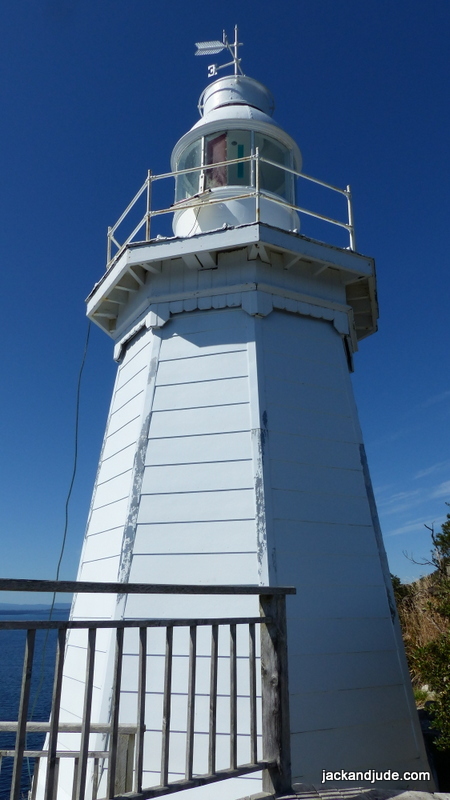 It also told us about the lighthouse keeper who lived in a tiny house on the island and kept the kerosene lantern lit in the white hexagonal wooden tower built in 1892, until it was automated in 1910. White hexagonal wooden tower built in 1892, Hells Gate in distance. 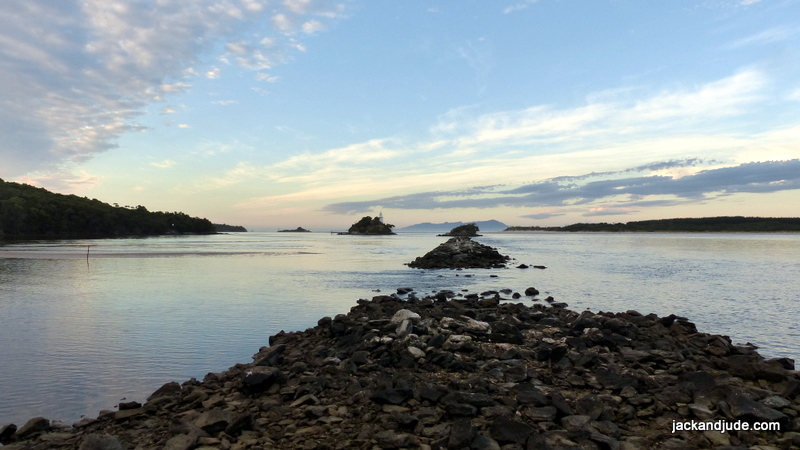 Not sure of where we’d camp, we paddled on towards the disused pilot station adjacent to Hells Gate. What looked to be well kept lawns around the few old houses, on closer inspection proved to be rather steep and rocky. 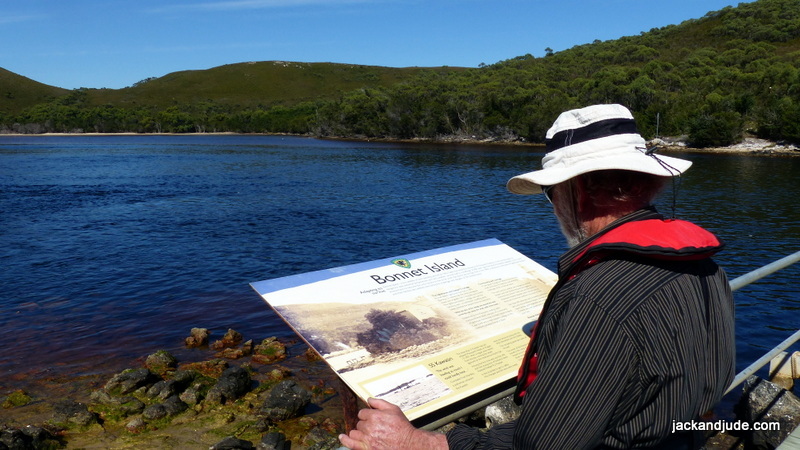 But as it was lunchtime, we pulled alongside a tinny tied to the jetty signposted, Danger – do not use, and scampered ashore to behold an astonishing view. Before us unfolded all the magnificence of Macquarie Harbour. 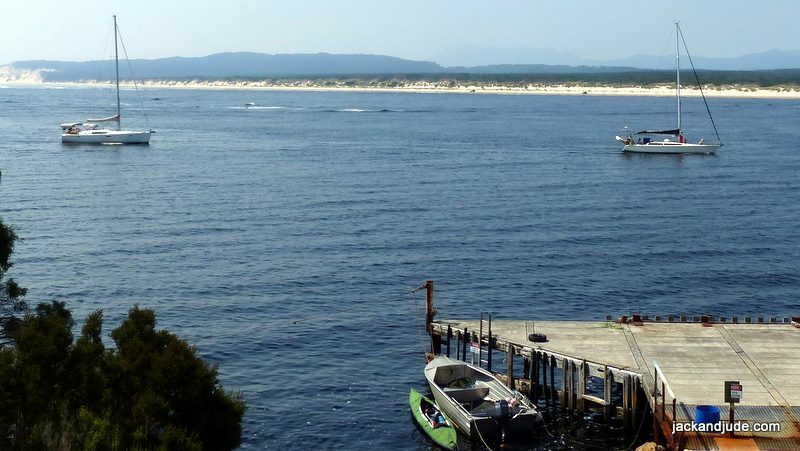 In the distance stood the bold mountains of Zeehan and Heemskirk, which as early as 1642 were sighted by Abel Tasman, and then named by Bass and Flinders travelling around the Tasmanian coast in 1802 after the two vessels used by Tasman in his epic voyage. Of the other mountains in view around Macquarie Harbour – most were names associated with the proponents for and against the ideas that Charles Darwin was putting forward in the late 19th century. Thomas Moore named Darwin, Geikie and Read and the Tyndall Range. And between 1860 and 1862, Charles Gould named Murchison, Sedgwick, Lyell and Owen; Huxley and Jukes were named later. Famished, under the shade of a tree next to an unoccupied house, we were making quick work of Jude’s picnic when a dilapidated 4WD rocked up. Out jumped three lads rather casually dressed carrying a cray pot and net along with a six pack to quench their thirst. “Nah, ours is the other one,” came back as they loaded up and whizzed away through what is considered one of the scariest narrows in Australia. We walked along the dirt track after that, seeing several more bombs lying about and then we came across a well kept shack overlooking the gate and Entrance Island. Calling out, a couple of blokes appeared and we chatted on the hillside overlooking the famous waterway. Nice guys who gave us heaps of info about this very isolated community of perhaps a dozen souls that have no road access, no piped water, no garbage pickup, and yet they’re charged normal rates. Strange as that struck me, it seemed okay when they said they took their garbage whenever going to town and used Strahan’s roads to go anywhere. I can’t remember their names, but they also told us about the track to the lighthouse, and invited us to help ourselves to water from their tanks. 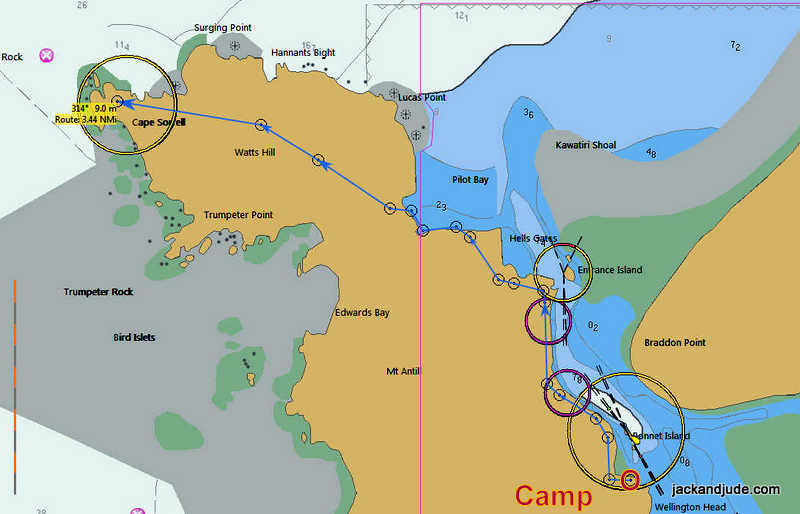 It was them that confirmed what Deek had told us about camping at Munson’s Bay next to Bonnet Island, and how there was a rough track from there. So, about three, we loaded up and set off this time against the tide to find a place to pitch our tent. Finding Munson’s Bay lined with firm white sand with a tiny stream pouring tannin stained rainwater out near where the beach runs into the hillside, we strolled the beach, discovering heaps of various foot prints, heavy ones from hairy wombats, wallabies, and paw prints made by what we discovered are Tassie Devils. Plus of course, prints from all kinds of birds. 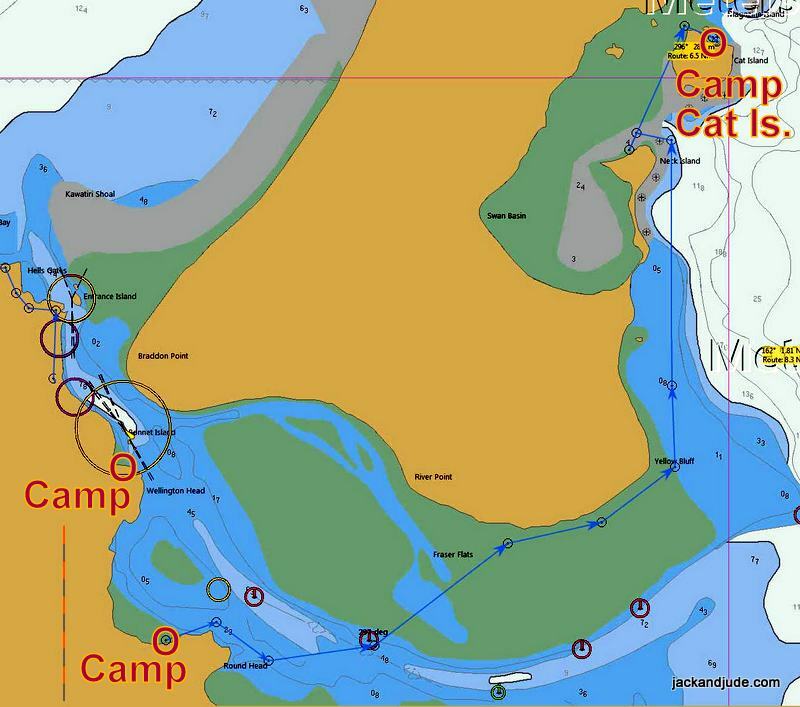 At the far end of the beach closest to the harbour, we found a fisho’s camp cut into the scrub, perfect for us. Flat ground carpeted with fine swan grass, a few makeshift benches, and even a plastic chair next to where they made their fire. 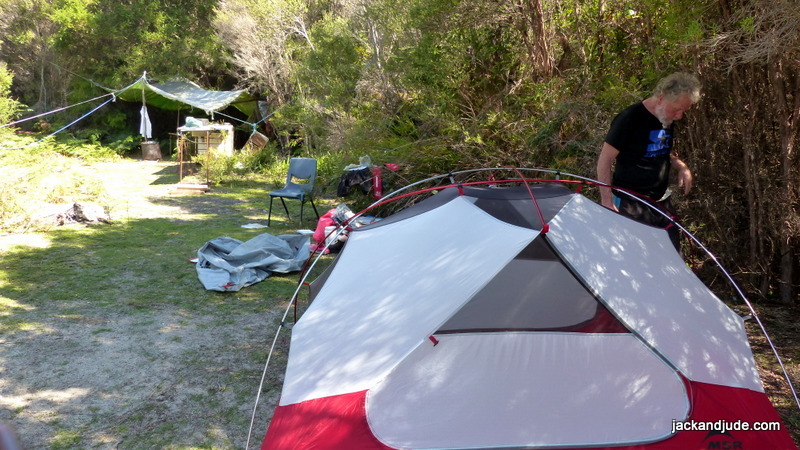 Easy we set up camp, erecting for the first time our new MSR Elixir2 tent. Jude hung all her stores from the poles holding up a plastic tarp, and then we jumped back into the Green Machine to try our luck at fishing. We’d already thrown a line in from the shore, but having no luck, we paddled around the headland south, discovering a huge new bay. Now this is the life. No timetable, drifting along observing nature. 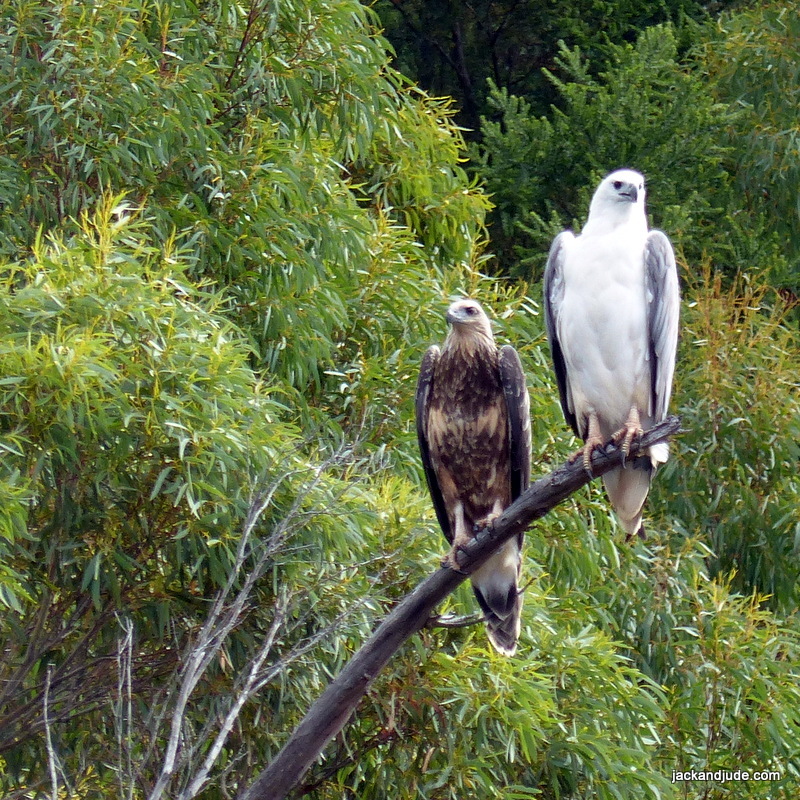 A few puffy white clouds hanging listlessly aloft while a beautiful white Sea Eagle soared on invisible air currents. Its huge feathered wings arched in Grecian splendor, tipped by telltales relaying every nuisance of the slight breeze. She swung round n’round above a pool of tiddlers jumping clear of their predators while we drifted in silently, our baited fishing line dangling right behind. Oh what joy to feel the first tug, followed by the jerk and instant reaction that brings in a tasty little fish. The first to flop about in the big soup pan that Jude had commandeered from the camp was an Australian Salmon of legal length. In our next drift through the jumping school, a savage baby barracuda hit the bait. Hmm, I’m no great fan of “couda.” Too bony, and often full of worms, but this fella was small and had met his maker on the trip aboard, so it joined the other one. Jude wanted one more. So back I paddled for another go. Wham, this time a cute little herring decided to take the bait, and of legal size, we had quite enough, so we paddled off to explore another camp we’d sighted. Most everyone has heard the controversy surrounding the fish farms located here in Macquarie Harbour, how they’ve been ordered to de-stock due to the massive degradation taking place in these once pristine waters. Well, we’re somewhat well versed in this having been coming here for many years and having lived through the move to triple the numbers of fish farmed. Back in 2012 the operators promised jobs and growth with minimum if any disturbance of waterways that had been undisturbed before fish farming began in 1987. Unfortunately since gaining approval, there have been lies and cover up over fish losses, massive polluting, and piling up of excreta killing everything under the cages. Well as we paddled into this quiet corner we witnessed another devastating result of over farming these nearly landlocked waters. 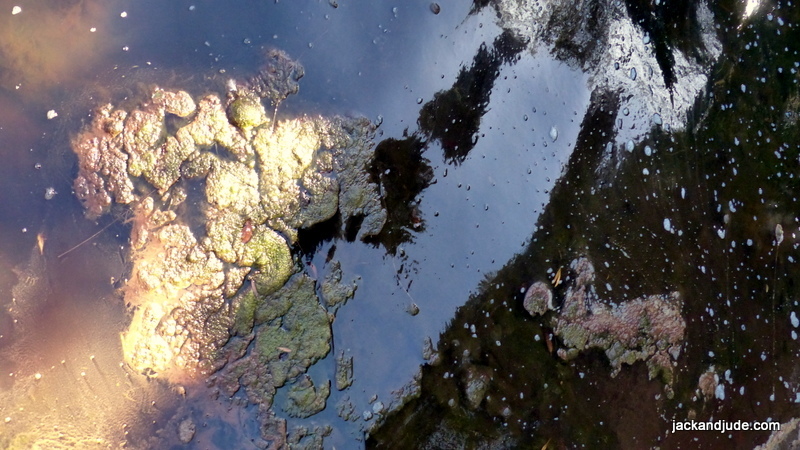 Atop the surface floated a stinky green scunge that extended in patches all along the bottom. Never seen anything like this before, except in polluted rivers heavy with agriculture runoff. The state’s Environmental Protection Authority director, Wes Ford recently said, “These are indications of nutrient enrichment and the licence conditions don’t allow for the presence of these mats outside the lease area.” We wonder whether he has any idea how many years, if ever, it will take for Macquarie to fully recover. Jack and Jude will say again that the future can be what we make it. But if left unchecked, our children will inherit a world devoid of wild creatures, filled with and overflowing with our pollution. 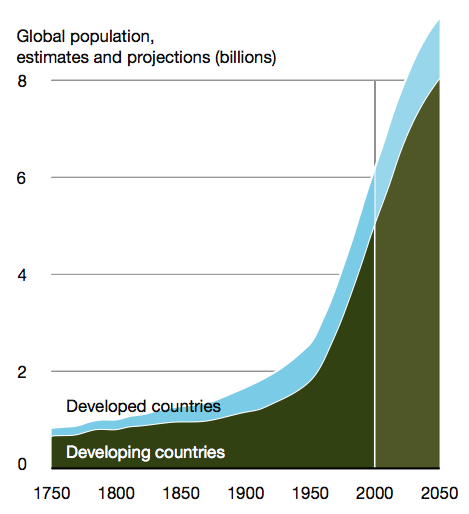 It’s time over population is seriously debated. Early the next day, after a grand sleep, we arose with the sun to prepare for our long day’s walk. It’s about 3.4 NM, or 6.3 kilometers one way to the Cape Sorell lighthouse. With side trips, say up to twenty kilometers round trip. Finding the trail out of Munson’s Bay took a bit of searching, but once through a bit of shore growth we found ourselves following a 4WD track that once must have serviced the power line leading to Bonnet Island. We passed several rotting steel uprights, some still with timber cross members and insulators, as well as two sets of leads in far better condition. 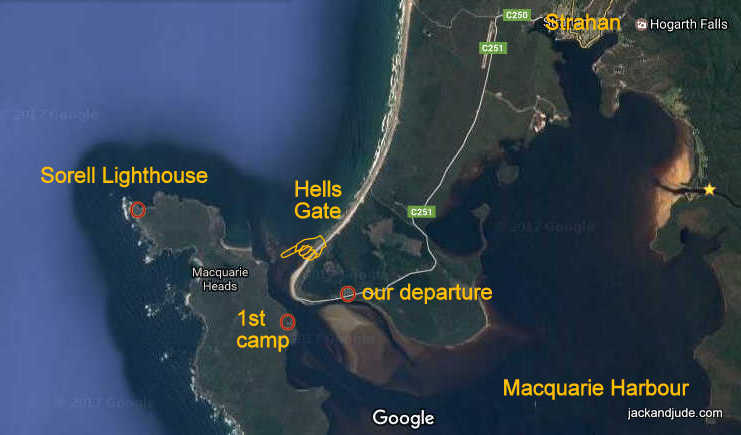 The track eventually came out under the old Harbour Master’s house, circa 1890, that possessed a commanding view of Hells Gate to far away Mount Sorell. Harbour Master’s house commanding an exquisite view from the gate to far away Mount Sorell. 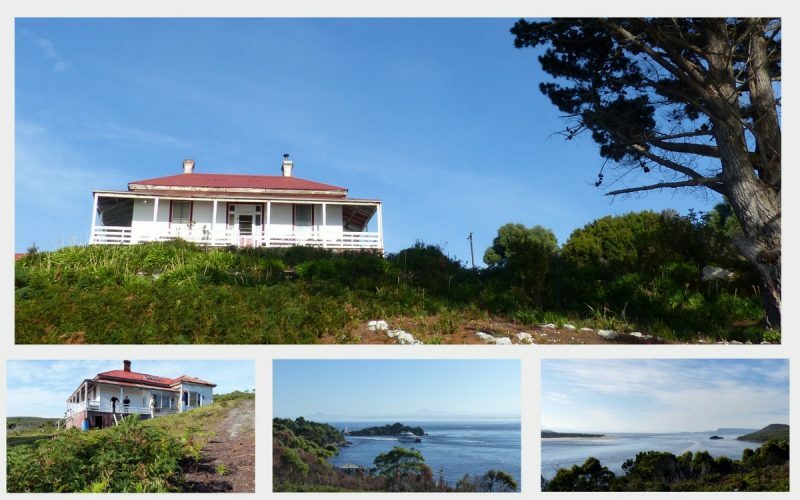 In sunny, very hot conditions, we enjoyed the scenic walk past the houses, through light scrubby forest to the wide fine sandy shores of Pilot Bay. 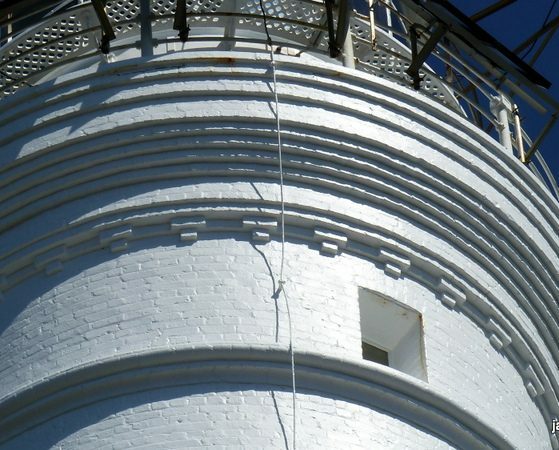 The track continues from its western corner, making Pilot Bay a convenient place for visiting yachtsmen to do the lighthouse walk. 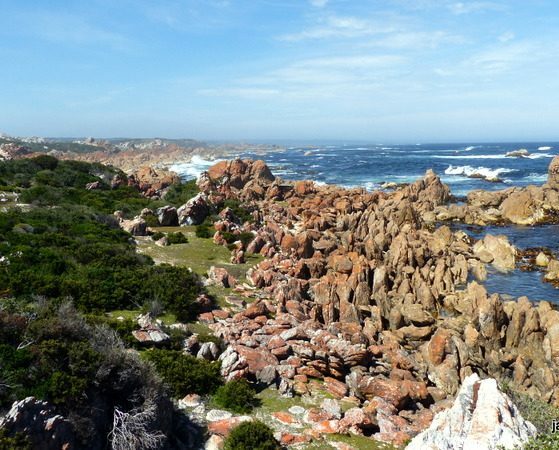 It rises directly after leaving Pilot Bay into open low vegetation revealing vast panoramas of both sides of this peninsula. 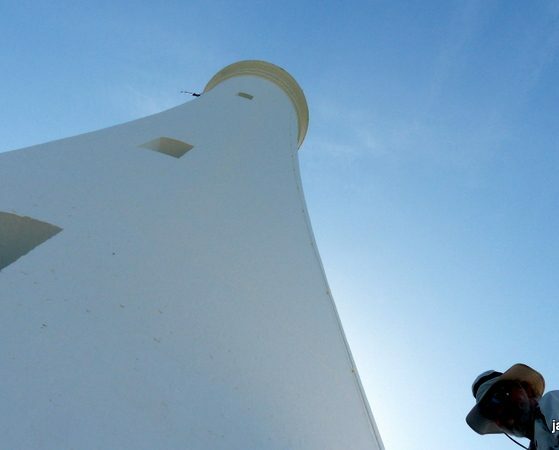 Behind us a far different view of Hells Gate unfolded, while ahead a wild blue and white vista of rock and breaking seas was capped by the 30 metre tall, slender tower of the Cape Sorell Lighthouse. Alone with my honey upon the sweet banks of yon forbidden shore, the world was ours to explore and imagine what could be. We’ve been blessed with long years surrounded by pure nature and the wild creatures, which has given us a deep respect for Earth, the creator of all life. From this we believe that we should be loving the true proof of a creator, Earth. Just imagine in a distant time, man in harmony with Earth, with time to explore these wonders. To reach this, we do not have to give up our comforts nor throw away our discoveries. In fact we will discover even more, and just maybe we will better understand the magic of the wild ones who can fly and swim, hover effortlessly, and return to the very same spot without any devices. Now that’s a future worthy of passing on to our children. Returning back to camp we were both elated and exhausted, and ate a simple meal and went straight to bed as the sun dropped below the western horizon. Leisurely the next day, we packed camp to paddle back around the southern headland to another sandy beach first seen during our first outing. We discovered it too had a lovely icy cool spring, and near it we found a flattish area behind the sand suitable for our tent. Leaving our gear, we then climbed the headland to spy our way ahead for we had to cross the strait again, this time bucking the prevailing outgoing current. Our journey home was completed in two rather arduous, physically tiring excursions that went off without a hitch. The first one a little bit frightening because we had to dodge the morning tourist boats taking visitors out through Hells Gate.They also produce a rather mammoth sized wake for little tykes like us. And then we had to negotiate the large shallows of Fraser Flats to reach Yellow Bluff. That’s the corner leading north to Strahan. Against the current and morning breeze, Jude and I definitely had a good workout. And that’s just what we wanted! It’s imperative that we stay fit or this wonderful life will come to an end. When out of food, four nights and five days after setting out, the welcome view of our very much cherished Banyandah hove into view, sitting very prettily on her marks. Thanks to Ronnie Morrison, we soon had plenty of hot water for lengthy, luxurious showers, washing away all the campfire smoke, and some of the aches, but not one of the life long memories could ever be washed away.